What is the clubs history? Horwich Cycling Club was founded in 1934, by a group of like-minded cycling enthusiasts. Formerly Horwich Wheelers, they became Horwich Cycling Club. The club has a long history in the community of Horwich which has been put into a book which is available through the club. What have been the clubs interests over the years? 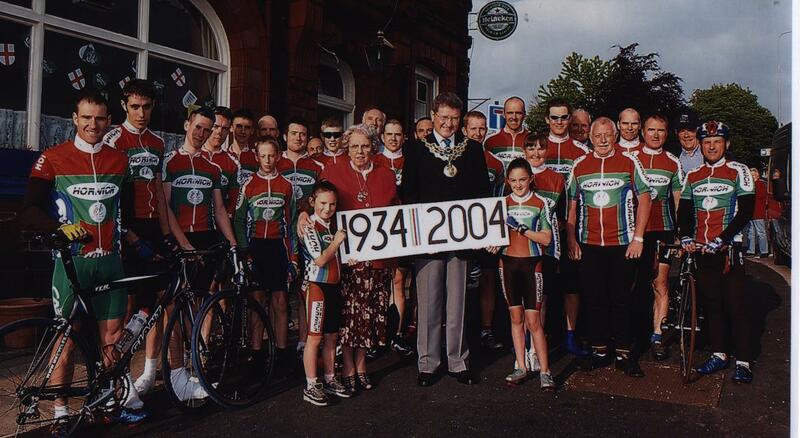 Horwich Cycling Club has a long successful racing history, almost as old as the club itself. 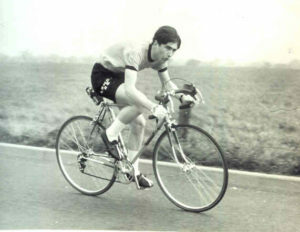 Road Racing and Time Trialing were the main backbone of the club in the 1950s and 60s, with many of those racing during these decades still active cyclist today. Thanks to sponsorship from Partingtons Cycles and Lusso Clothing in the early 80s to mid 90s, our riders were well supported, and the club attracted several top international riders. Top Time Trialist and former competition record holder Dave Smith, International road racers John Kavanagh and John Fiddies and former Peace Race rider Vinny Smith were frequently in action in the major races across Britain and Europe. All represented the club in Star Trophy races (the predecessor to the Premier Calendar) as well as the Milk Race and more locally, The Tour of Lancashire. Vinny can still be seen in action, along with the other club veterans at British Cycling and LVRC events during the season. The veterans have won rounds of the Peter Fryer National Veterans Road Race Series and Vinny Smith was LVRC National Champion in recent years. Dave Leyland, a former professional with the Harry Quinn team in the 70s, is another who returned to racing when ‘life began at 40’. John Fiddies, although not a racing cyclist now, is still active in cycling and has organised the clubs Pete Fryer race, and was actively involved in the 2002 Commonwealth Games road race events held at Rivington. How does the club support Cycling? Unlike many other cycling clubs, Horwich CC believes in putting a lot back into cycling. The club hosts cycling events in the local area throughout the year. These have included the concluding round of the British Cycling National Veterans Series – The Peter Fryer Trophy. This year saw the resurrection of the Rvington Road Races as part of the popular Recycling Road Race League in the North West. The club has also hosted many cyclo-cross races during the winter season. Success in this arena in recent years, along with the benefit of a centrally located and challenging course at Queens Park in Bolton, has allowed the club to hold this year the annual ‘Roses Challenge’ and one of the biggest events of the 2003-4 season, the Inter-Area Championships in January 2004. Off the back of the success of the Commonwealth Games in 2002, the club was also able to resurrect the Horwich Carnival Road Races, held on a tight 1 mile circuit in the town centre. These are held in association with Horwich Town council, and organised along with Horwich RMI Harriers. Sponsors include Asda, and Miller-Melcalfe Estate Agents. Full details on the special site www.horwichcarnivalraces.co.uk .A variety of time trials are also held, usually on the Garstang courses, near Preston. No, The club was successfully sponsored during the 80s/90s. It is not currently sponsored, however, the numerous successful races that the club hosts have been sponsored on an individual basis by local cycling shops, and other local and national businesses, including Asda. Do the members only ride local events? No, riders represent the club throughout the country and beyond. Riders of all ages can be found racing in National Series events and Champioships both on and off-road. Veterans regularly ride in LVRC and British Cycling events throughout the country and ride in National Championships. Riders have also represented the club in the Sleepless In The Saddle 24hr MTB race, Paris-Roubaix MTB race and the National Track and Cyclo-Cross Championships. Wasn’t Horwich used as part of the Commonwealth Games in 2002? Yes, Horwich was used for the Road Races, Time-Trials, and Mountain Bike Races and the last Commonwealth Games. Part of the circuit used for the road events forms the 4.5 mile Rivington circuit used for local road races and chaingang training. Many of the club’s members were involved in the organisation of the events and were key personnel at the road and MTB events. More information about the Commonwealth Games Federation can be seen here, and the next Commonwealth Games in Melbourne, 2006, here. And the National Road Race? As a prelude to the Commonwealth Games events, Rivington hosted the British Cycling Elite Mens Road Race 2002, sponsored by TravelWise. This was a full dress-rehearsal for the Manchester 2002 organisers. The race, run over a longer distance than the Games RR was won by Julian Winn, who followed this up by a successfull following year on the continent and a finishing ride in the Giro d’Italia. It is not just road riding that the club has excelled at. Cyclo-Cross and Mountain Biking have also been popular amongst the members. Horwich stalwart Eric Taylor has competed in numerous editions of the gruelling 3 Peaks race, with top 20 results along the way. In recent years the club has enjoyed something of a boom in it’s cyclo-cross success. Taking the team championship in the North West Cyclo-Cross League during the 2001/2 season, this was repeated in 2002/3, 2003/4 and 2004/5 seasons. Mark Leyland became the first Horwich rider ever to be crowned North West Cyclo-Cross League Champion in 2002/3, which was repeated in the 2003/4 and 2004/5 seasons. Many of the club have also represented the North West at the Inter Area Team Championships. The club has also been represented in the local criterium series at Preston Arena, and in the North West region Recycling.co.uk Road Race League, as well as numerous LVRC events. On the mountain bike side, Roy and Amy Hunt, who now ride for Science In Sport and Onimpex-Bioracer respectively have achieved numerous successes at national and international level. Amy is the current Women’s National Circuit Race Champion and Roy is the Over 50s National Cyclo-Cross Champion. Both remain second claim members of the club. And the future of HorwichCC? When the more mature members of the club finally hang up their wheels, there will be a strong new young membership to take over the helm, with Liam Worthy, Adam Wood, Rick Sale and Andrew Davies already demonstrating their abilities at every discipline. These guys look like being the future HCC stars. Is the club just for racing? Not at all. The club has a number of members who do not race and ride their bikes purely for fun and fitness. It’s good to ride in a social group at a steady pace, along the many country lanes in the area and stop for a quality cooked lunch. With cycling getting more and more popular now, the club has members from those who have only just got on their bikes, to members who have been riding for over 50 years! Any experience or speed is welcome and everyone gains from riding with others. I’m interested in knowing more about the club. Where do I go? If you would like to learn more about the club, and possibly join, please use the contact us page by clicking here.